Looking for some Christian wit and wisdom? What are the two most important things in the universe? Bacon sandwiches and Salvation, suggests Adrian Plass. In this book, you'll find out why!! Bacon Sandwiches and Salvation by Adrian Plass was published by Authentic in February 2007 and is our 3737th best seller. The ISBN for Bacon Sandwiches and Salvation is 9781850787235. There is so much packed into this book, you will find something to laugh about whatever your sense of humour. But don’t be fooled; in the usual Plass style, there are seriously serious pieces interspersed with the shorter jokes, to pull you up short and make you think more deeply. You would get mental indigestion if you sat down to read this book all through, but a short read at odd moments, will do you the world of good. A brilliant 'butty' of a book!!! The type of book you can dip into, or read all the way through. I Loved it! Great to read alone, and also a great book to read with others; one minute you are laughing, the next you are being challenged and it contains so many true definitions!! What a great observer of Christians, Plass is; and how true of so many of us, and so many churches we are in or have been in!!! Got a question? No problem! Just click here to ask us about Bacon Sandwiches and Salvation. 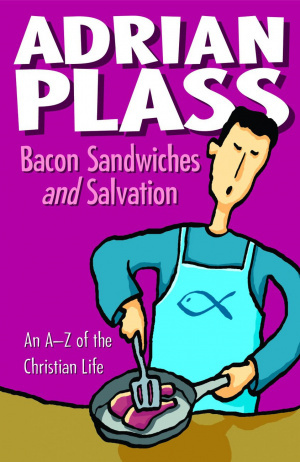 What is Bacon Sandwiches and Salvation by Adrian Plass about?